Just like zip, 7Zip is a popular archive file format. For an end user, extracting zip file is more easy as compared to 7zip archive files – because 7zip files require special 7zip archive software to extract its contents. 7-ZIP SFX Maker is a useful tool to convert 7Zip archive files into self executing EXE files. 1. Download 7-ZIP SFX Maker, unzip the 7zip file [use this]. 2. 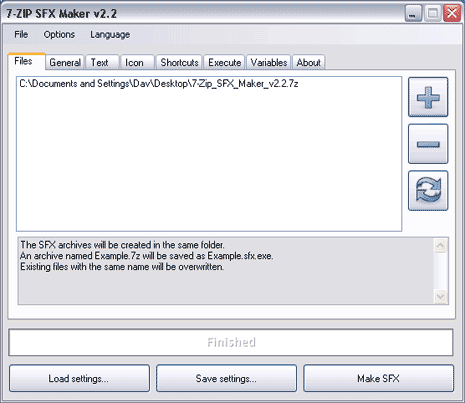 Double click 7-ZIP SFX Maker icon to launch the program. 3. Click “+” sign to browse and add 7Zip file. 4. Hit the “Make SFX” button at bottom right to create EXE file. After the conversion into an EXE file, you will not need any special software to extract contents. Just double click the resultant EXE file to view its contents with ease. One handy tool for web developers to distribute their software tools as exe instead of 7zip archive file. As an open source program any one can download and use 7Zip without any limitation. Then why we need this tool.